How to Make Wedding Butterfly Release? 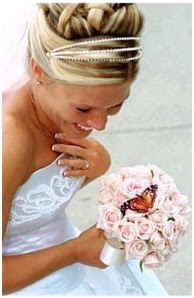 Releasing butterfly at wedding can be a memorable moment not only for the bride and groom, but also for the guests. There are so many ways to make wedding ceremony become unique and releahoiing butterfly is one of the options. Who don't like butterflies? This kind of insects is very popular because of its beauty. Butterfly's wings have many incredible colors, so they’re very nice to be seen. I bet butterflies will give enjoyment at your wedding. There are some tips to make a wedding butterfly release that so simple but important. 1.Deciding when the butterflies is released, you can let them go when the bride walks to the altar, soon after the couple say I do or when the couple leave the altar. It’s up to you, the moment is yours. 2.Deciding who will release the butterflies. You can give a couple of them in a little box to all guests or only the bride and groom do it themselves. 3.Deciding where the butterflies are placed. If the butterflies will be given to the guests, you can make a little boxes, envelopes, or origami. The most important is never harm these beautiful insects because the containers too small. Remember to put a note to the guests about when butterflies should be released. But, if the couple will do the releasing, a cage or basket with satin, ribbon, and flower’s decoration is the perfect place for butterflies. 4.Deciding how many butterflies will be involved. Although it’s depend on the wedding impression, but commonly 3-6 dozens will make a good showing on this important occasion. 5.Deciding what kind of butterfly will be used. There are so many types of butterfly like, Red Admirals, Gulf Fritillaries, Black Swallowtails, Giant Swallowtails, Monarchs, Painted Ladies, American Painted Ladies, Zebra Longwings, and Mourning Cloaks. But the most popular to be released are Monarchs and Painted Ladies type. 6.Deciding a butterfly farmer supplier. Select a good reputation and experience butterfly farmer. Usually, they know how to handle butterfly for wedding and they can give some tips to treat them well before released. No part of this web site may be reproduced or transmitted in any form without prior permission of the Website Owner.